Description: Designed with a curved profile and a clean architectural look, this appealing and versatile ceiling fixture defines a sophisticated aesthetic. This fixture features a distinctive Cream ArrowRoot shade, which is enhanced with a Statuario Idalight bottom diffuser. The hardware is featured in a Nickel powdercoat finish. This fixture illuminates with 4 customer supplied, 42-watt GX24Q-4 base, Compact Fluorescent Lamps (CFLs). 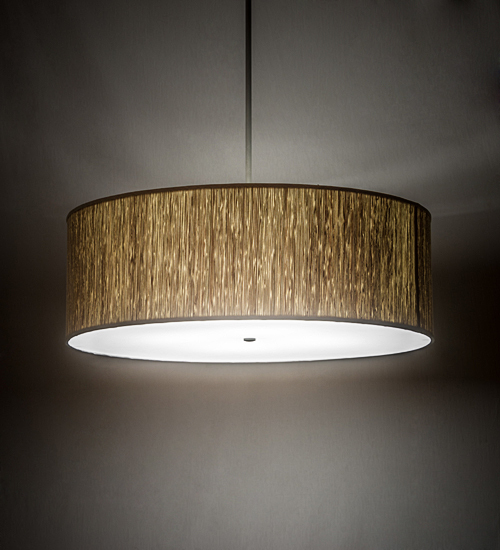 Handcrafted by highly skilled artisans in our manufacturing facility in Upstate New York, this transitional styled fixture is available in a wide range of custom choices including various designs, colors, sizes and dimmable energy efficient lamping options such as LED. UL and cUL listed for damp and dry locations.